Days Japan International Photojournalism Awards 수상작. 사진의 워터마크를 보고 구글링을 했더니 유명한 전쟁사진가로군요. 아래의 주소에서 이 사진의 코멘트를 찾았습니다. 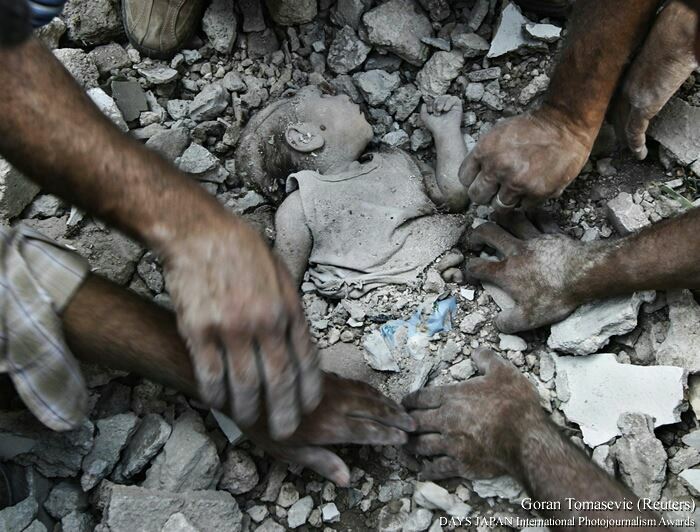 "Syrian clear rubble surrounding a young girl who was killed during a Syrian Air force air strike in Azaz." 시리아군의 아자즈 공습에서 사망한 여아의 시신을 폐허에서 꺼내고 있는 장면입니다. 제임스 낙트웨이와 케빈카터가 생각납니다. 왜 사람은 고통과 비극을 통해 지금을 확인하는가에 대한 질문을 다시금 내 가슴속에 던지게 되는군요.